Professional quality brushes that are comfortable to use and feature bold coordinating colors that make a statement. 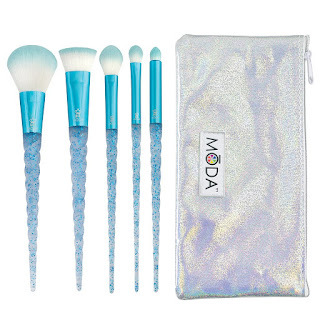 This 6pc MŌDA® Kit is what your unicorn dreams are made of- functional brushes with a unique style! We've selected five brushes to complete endless looks and have included a cool holographic pouch, perfect for travel or at home on your vanity. Multipurpose Powder: Assure that foundation and contour are uniform by buffing and blending with this multitasking brush. Precision Contour: Contour with creame or powder to get killer cheekbones. Highlight & Glow: Perfectly shaped to apply precise highlights to the entire face. Shader: Sweep a blend eye shadow over the entire lid. Smoky Eye: Apply shadow in the crease and close to the lash line for a dramatic smoky eye. Create a flawless complexion with the MŌDA® Prismatic Face Perfecting Kit. These dense, ultra-soft brushes apply and blend cream and liquid makeup with minimal absorption, leaving more makeup for application. The unique shapes are designed to fit the contours of your face for optimal blending. 801: Use this large brush for all over cream or liquid foundation application. Move the brush in one fluid movement over your face to apply and blend. 802: Ideal for blush or bronzer application for a stunning glow. 803: Create a flawlessly blended contour under your cheekbones, along your jawline, or at the hairline. 804: This small brush is perfect for precisely applying concealer, blending makeup under your eyes, or for contouring your nose or other small areas of the face. MŌDA® PRO takes MŌDA® to the next level! This line features superior quality filaments and modern, professional shapes. Angle Shader: Apply eye shadow evenly. Crease/Smudge: Perfect for precision blending and detail. Eye Shader: Used to build intense color on the eyelid. Smoky Eye: Apply shadow close to the lash line, extending slightly at the outer corner. Brow/Liner: Perfect for eyebrows or eyeliner. Lash/Comb: For precision brows and lashes. 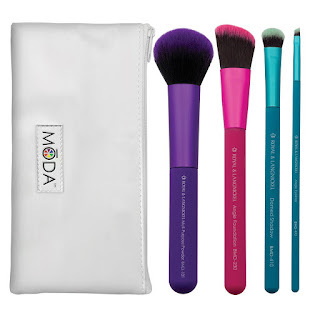 This 5pc MŌDA® Kit includes professional quality brushes that are comfortable to use and feature bold coordinating colors that make a statement. The pouch is perfect for travel and easily wipes clean. BMD-101 Multi-Purpose Powder: The perfect brush for buffing and blending to assure that all your contouring and foundation are uniform. BMD-230 Angle Foundation: Great for all-over foundation application and to apply around your eyes and nose. BMD-410 Domed Shadow: Expertly blend eye shadow over your entire lid. BMD-490 Angle Liner: Soft angle brush with chisel edge for precision at the lash line. The MŌDA® Tools Heart Scrubby was designed to gently help remove stubborn makeup from cosmetic brushes. Just use gentle shampoo, and buff the brushes into the heart! The heart shape fits snuggly in your hand or in the sink for easy cleaning. Beautiful brushes from MŌDA to beautify you! I've only recently discovered MŌDA brushes, but boy am I glad I did. I had the pleasure of checking out the products above and I'm absolutely in love, and such a fan of MŌDA brushes! MŌDA's MYTHICAL 6PC FROZEN FLIGHT KIT is absolutely stunning! 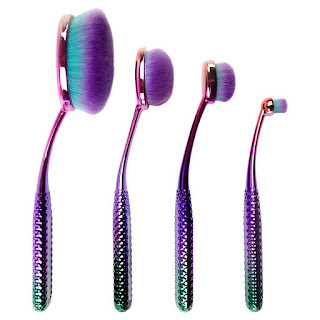 This set comes with five brushes and a super cool holographic pouch so that you can keep all your brushes neat and clean when not in use. These brushes not only feel incredibly soft but they look gorgeous on any vanity. It comes with a Multipurpose Powder, Precision Contour, Highlight & Glow, Shader and Smoky Eye brush to help you apply your makeup like a pro. It's the perfect set! 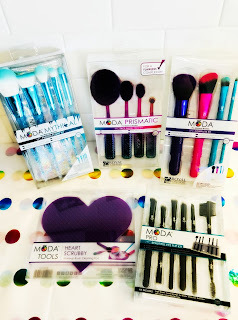 MŌDA's PRISMATIC FACE PERFECTING KIT is the stuff dreams are made of! These four gorgeous brushes are dense, ultra-soft and make applying and blending cream and liquid makeup oh so easy. The unique shapes fit the contours of your face for optimal blending and give you an airbrushed finish you will love! Lash/Comb and easy to use Flip Case. It's the perfect set to help you get those gorgeous eyes you desire! MŌDA's 5PC COMPLETE KIT is your complete kit to get you ready in a hurry! It includes professional quality brushes that are comfortable to use and feature bold coordinating colors that make a statement on any vanity. 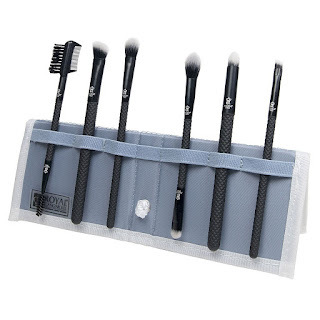 It also comes with a pouch to help you keep your brushes organized and clean when not in use. It's a stunning, complete kit to help you look your best! 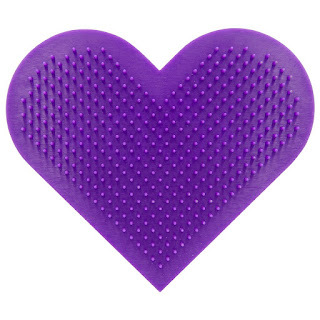 MŌDA's HEART SCRUBBY CLEANING PAD is a must have! It's designed to gently help remove stubborn makeup from cosmetic brushes to keep them clean and sanitized. Simply use a gentle shampoo, and buff the brushes into the heart, then let them air dry overnight. The heart shape fits comfortably in your hand or in the sink for easy cleaning. It's an absolute must have for anyone who uses makeup brushes! MŌDA definitely has some beautiful brushes to help beautify you! Click HERE to learn more about MŌDA! 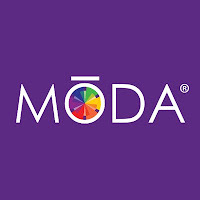 Follow MŌDA on social media!